Good morning people. You never know what manner of joy the inbox will deliver each day, but sometimes it is really wonderful. Meet new people, share stories, know there probably won’t be time to forge new friendships – judging by the old friendships that have cobwebs on them due to the shortage of time and the things I have chosen to undertake. But on the bright side, I learned that I’m not the only person who is infatuated with fly art, and many if not most of the people I’ve met are far more advanced in their artistic endeavors than I am. 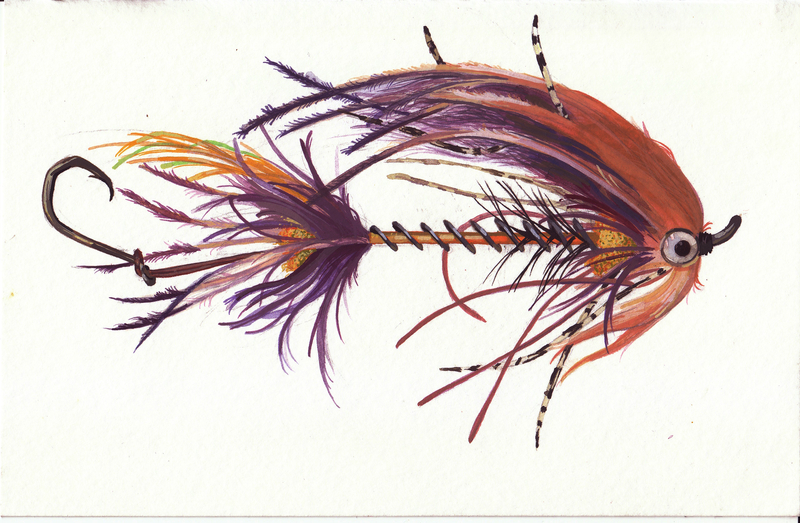 This morning, I wanted to share a painting by Nathaniel Price, a fellow fly tier – angler – artist. Nathaniel Price Intruder Painting, April 2015. 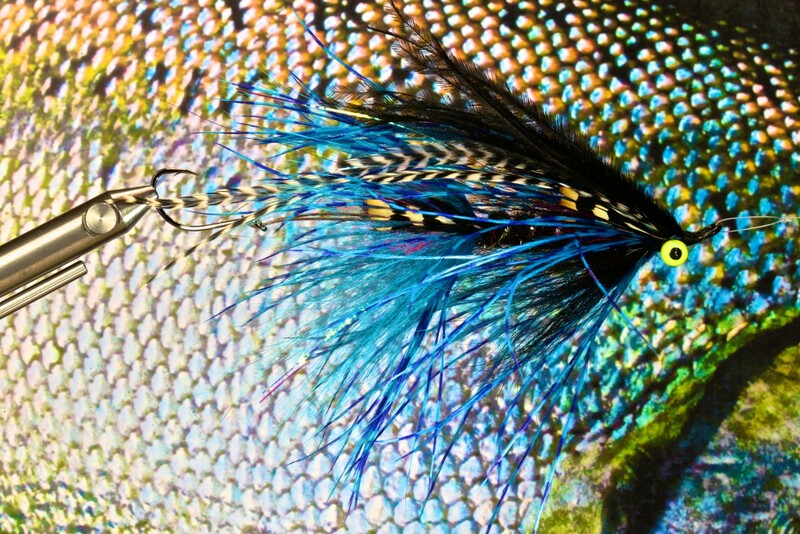 Thank you Nathaniel, for sharing this image to inspire my tying. If several people were willing to share their art with me I would include their work in one or more of my new books that are presently in production, destined to join the nine titles already available on Amazon. May you all have a good day ahead of you. 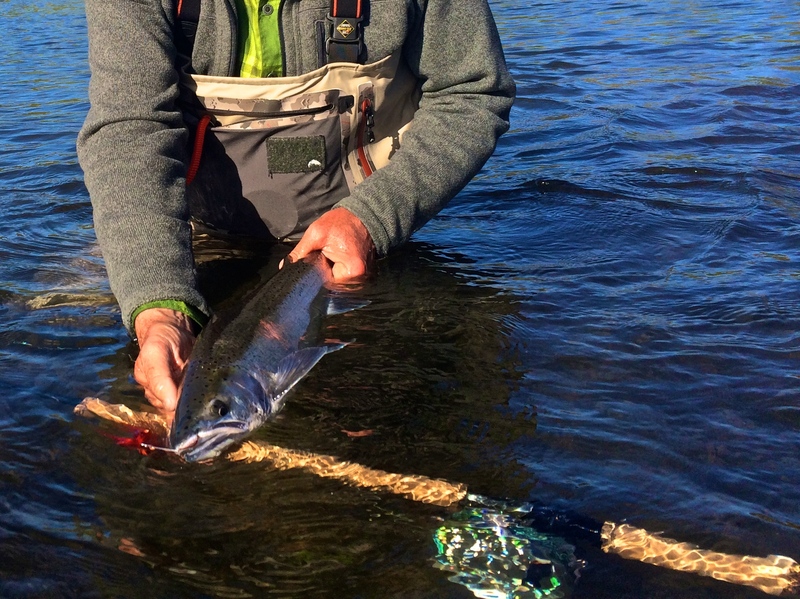 Three Flies to Fish Out of Pacific City – in a single day! 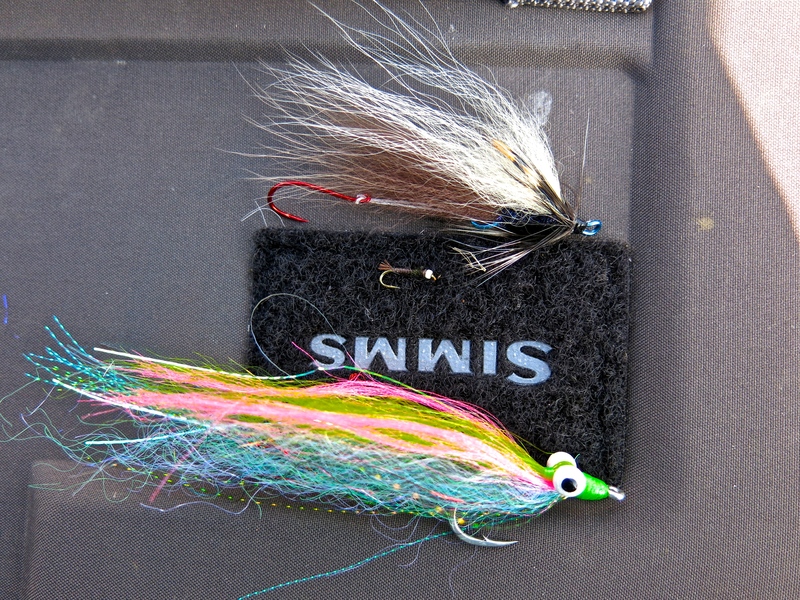 I had to chuckle the other day when I glanced at my SIMMS Boat Bag and noticed the wild assortment of flies tangled in a little scruffy patch on the top of the Bag. Among the dozen or so flies were three that I had recently fished in a single day, and caught fish on too. Pacific City is a paradise for me, my analog to Rodrick Haig Brown’s Campbell River home that I read and dreamed about my entire life. The fishing opportunities within an hour of our cabin are so rich and enjoyable, and while there are certainly more glamorous and exotic destinations around the state and the world, I find myself quite amused and engaged with the fishing here close to PC. The day in question began with a quick trip into the Ocean with Ed and Kevin in their dory, fishing for pacific black rockfish, blue rockfish, and lingcod. 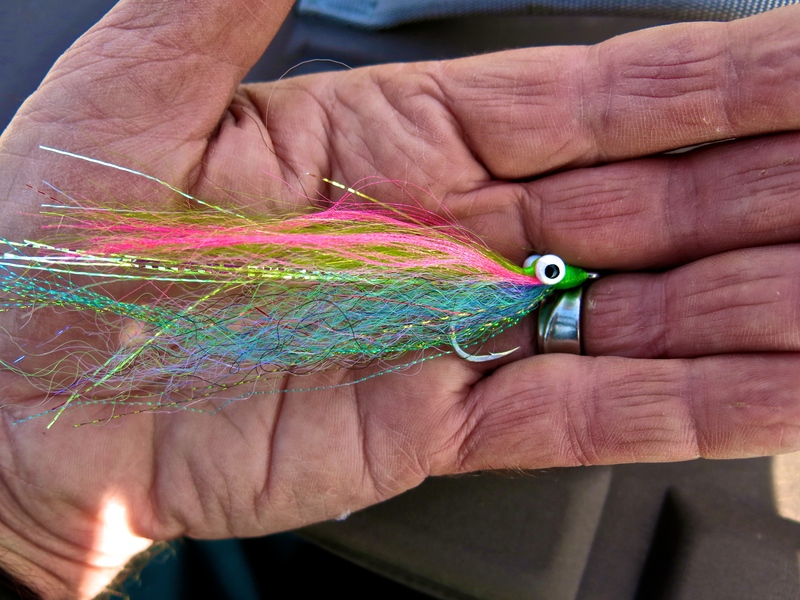 The morning fly for the ocean – a fine clouser. This modest size clouser caught 4 species of bottom fish, including blacks, kings (nope, that is the auto correct changing “lings” to “kings“, blues, and yellowtail rockfish. On the beach by ten AM, I had to rest, so I took a short nap, re-read a few entries in the Fly Fishing Book of Revelation and then headed up to the Town lake, a mere three minutes from the cabin. 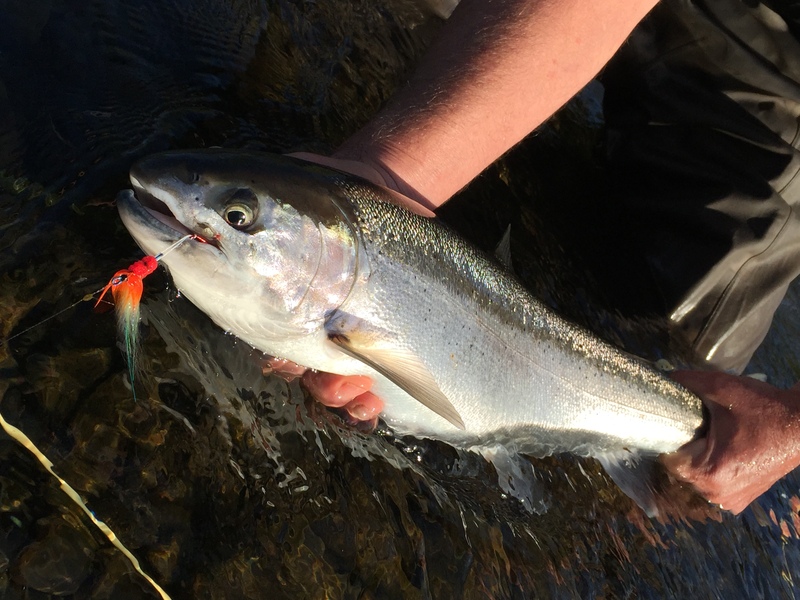 The little Chironomid nymph in a size 16 was about right to entice a nice summer steelhead kelt that was all shiny and full of jumps and runs, plus a few hatchery trout. Note: the hatchery trout prefer a bead head gold ribbed hares ear nymph to the buzzer. 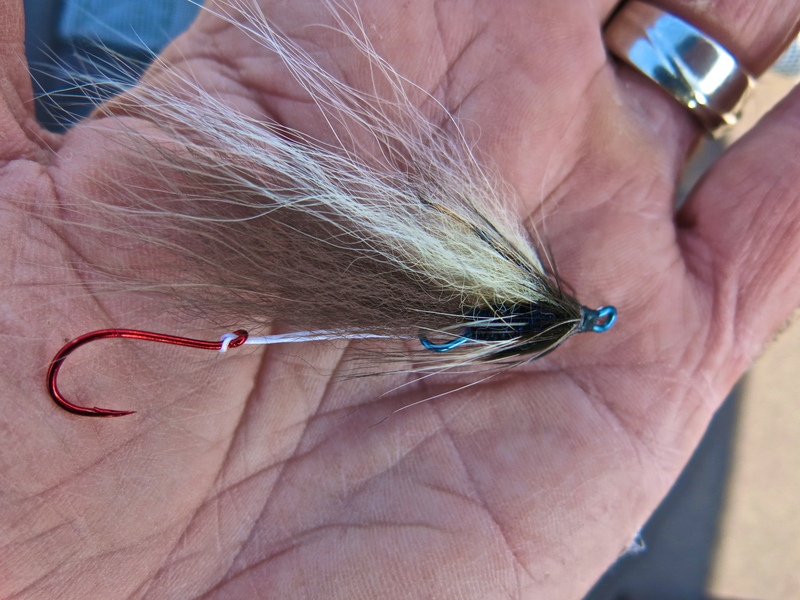 Size 16 Chironomid Nymph – perfect for the Town Lake Steelhead. Back from the lake by 3 PM, I unloaded trout rods, donned waders and cleated boots, and drove up the Nestucca, where I swung flies throughout the evening. 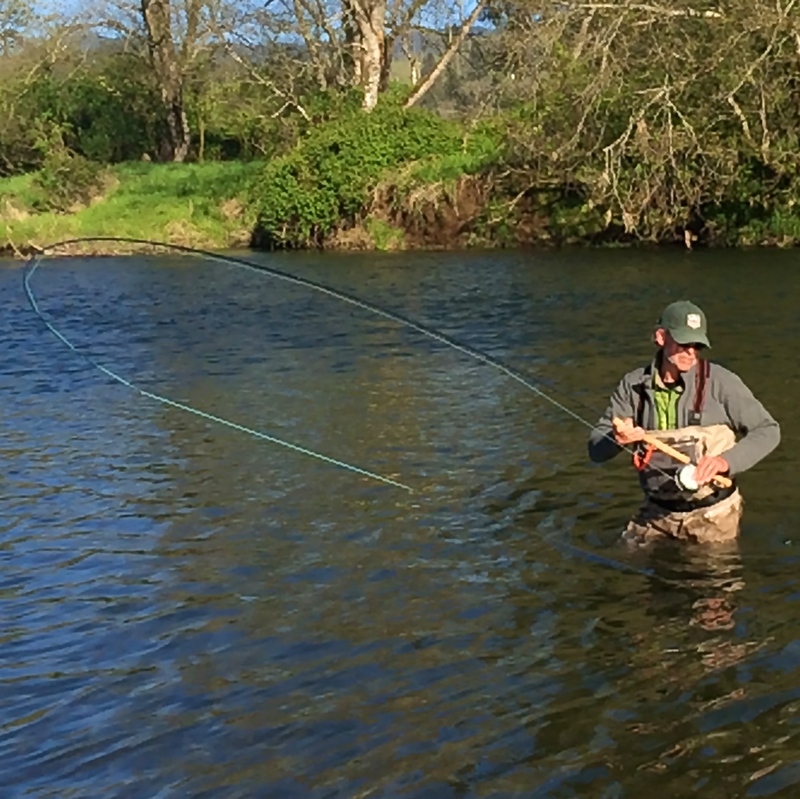 I did not hook any steelhead on this particular day, but on many occasions I have, and (fish or no) any evening swinging flies in a river that is only 20 minutes from my door is a great joy. 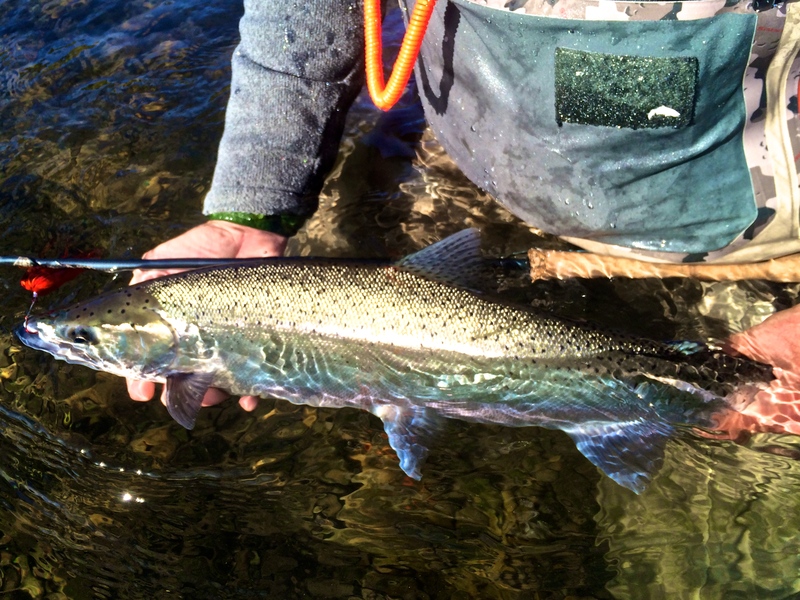 One of my favorite winter/spring clear water steelhead wet flies. Of course there is always work to be done, like mowing the lawn, tidying tackle, tying flies, writing about these adventures, working on book creation and sales. and helping Chris with customer recommendations, not to mention an occasional fly tying video. But all in all, life is good and the sight of these 3 flies helped me remember just how diverse the fishing opportunities here on the Oregon Coast. I bet there are many places around this state and others where you could fish three wildly different flies in a single day too, and I’d love to hear from anyone who is willing to share their home water stories. Wild Juvenile Chinook in Nestucca River during April, 2015. 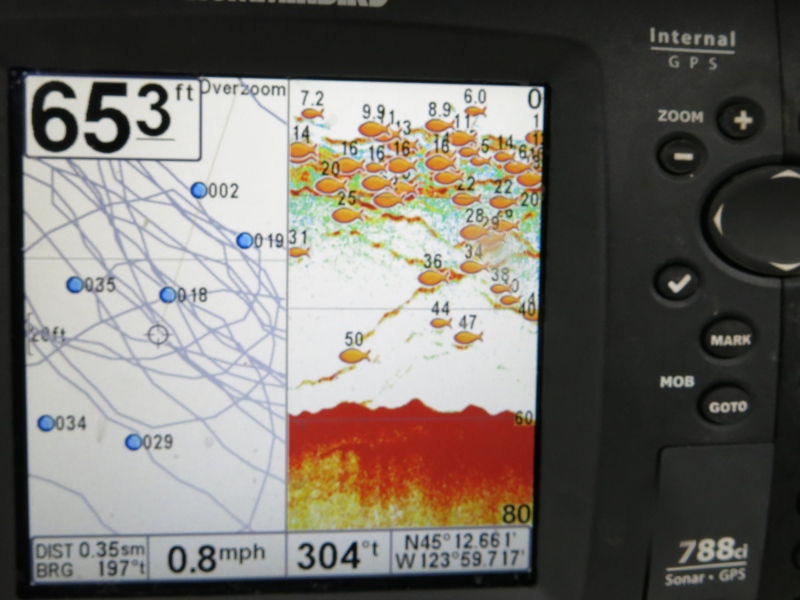 Much of the time when we are fishing our focus is very narrow. Sometimes, it is startling to see what is going on in our coastal rivers. 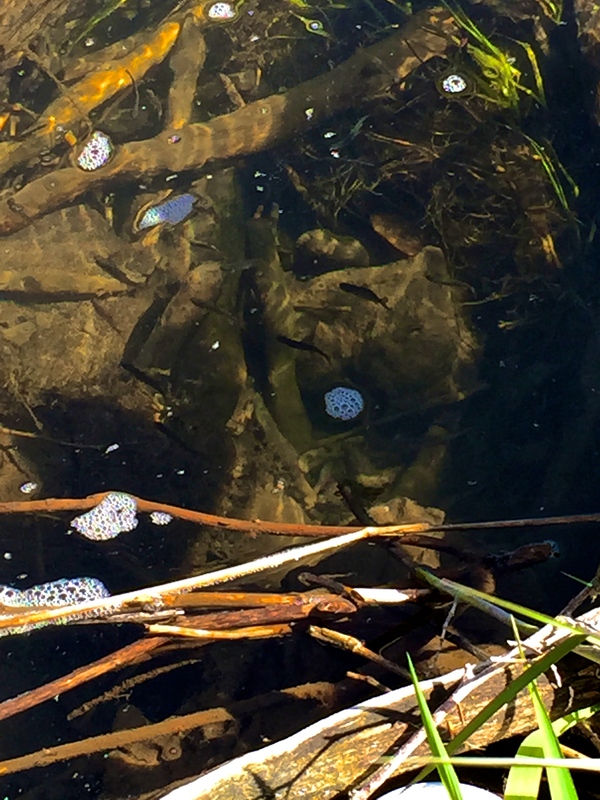 The photo above, not so very good an image, taken with cell phone last week, shows (I think) a dozen juvenile chinook salmon suspended in a little pool at the river’s edge. The Nestucca and all of our coastal rivers are alive right now with these tiny little salmon, and soon the coho and steelhead fry will join them as they continue to emerge from the gravels. To be sure, there could be a few steelhead fry out already but I’m pretty sure that most of these little fish were chinook, but of course I can’t be sure. Just wanted to share this image and the thought, in hopes that our rivers may always support vigorous runs of wild salmon, trout, and steelhead. Let’s hope that those who follow us in fifty and a hundred years see as many (or more) little fish in the rivers as I did just recently. I noticed a steelhead carcass in the water near the Three Rivers boat ramp. I expected that crawfish would be picking on the meat at night, but I was surprised to see a cloud of Chinook salmon fry hovering above the carcass with little fish picking at the meat. This is not something I expected from juvenile chinook here in Oregon, and I was really pleased to be able to see it first hand. If you are a salmon conservation advocate, student of the historical record of salmon conservation, or simply a person passionate about the future of wild Pacific Salmon, you might find Conversation With A Salmon of interest. 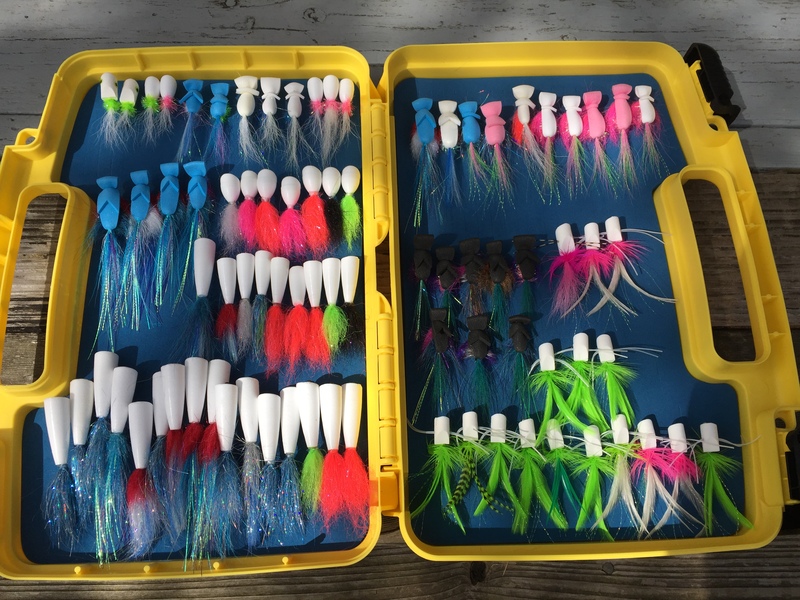 The Big POPPER Box, ready for action – anything from steelhead, sea bass, and silvers. 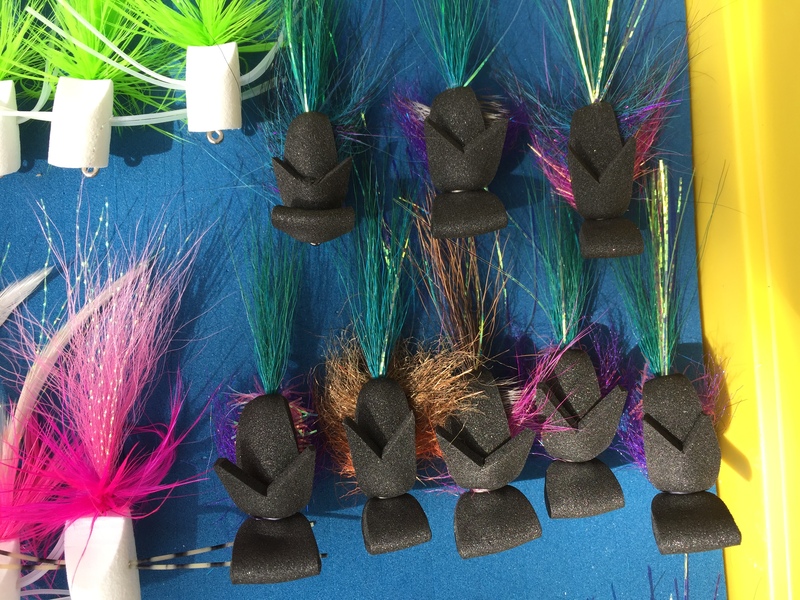 Given the recent bonanza in surface action fishing for Pacific Black Sea Bass in the ocean near Cape Kiwanda, I have been focused on tying a variety of Poppers and Gurglers. I have fished these crazy surface flies in a variety of forms, including the ones i make using the Gary Krebs Popper Jig cutter Jig set. These were the poppers I had the most experience with, but this season I have expanded to tying and fishing large and small Gurglers. These are wonderful flies to fish, they are very effective, and they only require foam sheeting to tie. My 3rd popper style is the hard foam popper body that I buy in a bag with hooks. 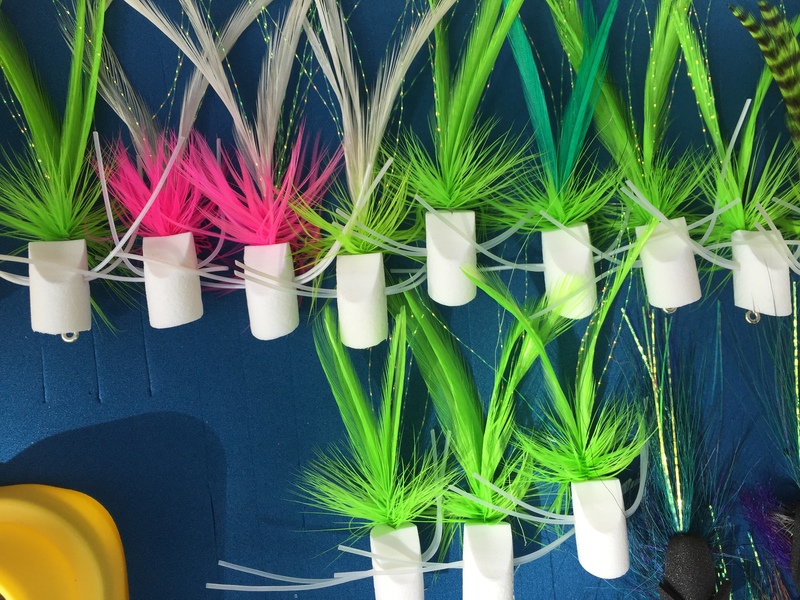 These just need to be glued onto the hook, and then I add a tail usually of bucktail plus one of several varieties of Enrico Puglesi’s 1.5 inch or 3 inch brushes. 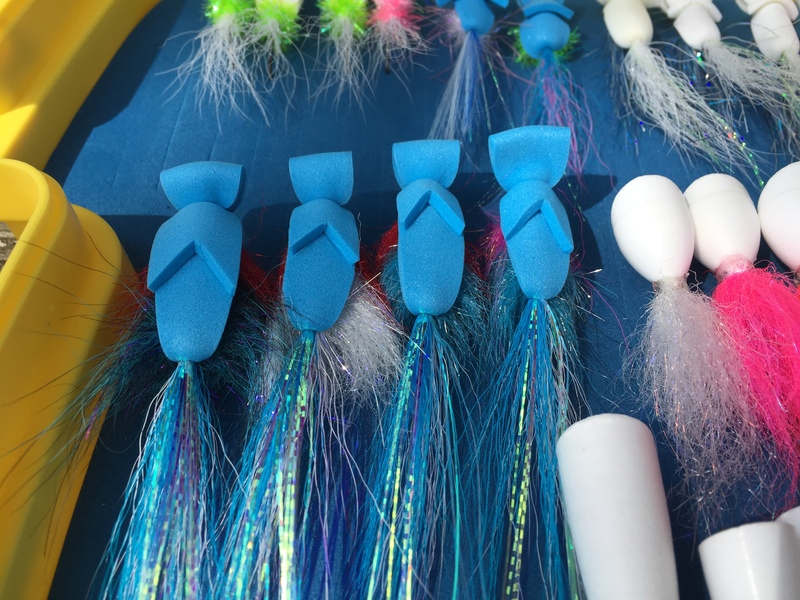 I especially like the Senyo Chromatic Brush, Minnow Head Brush, and the Anadromous brush for creating a collar on these Poppers. 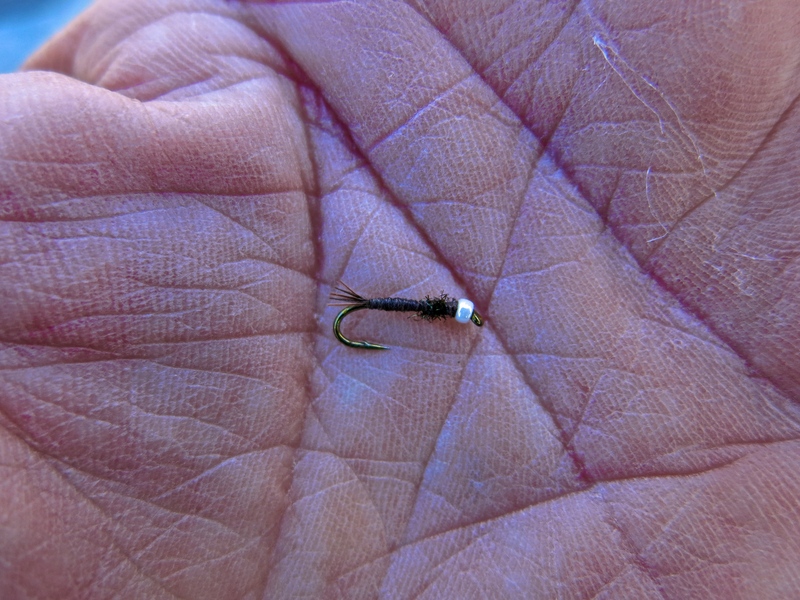 Expect some fly tying videos on the Caddis Fly Blog eventually, but for now, here are some images to whet the apetite. Small Poppers created with Gary Krebs Popper Jig set. Blue Foam Anchovy Gurgler inspired by John Garrett’s Facebook posts. Thanks John! 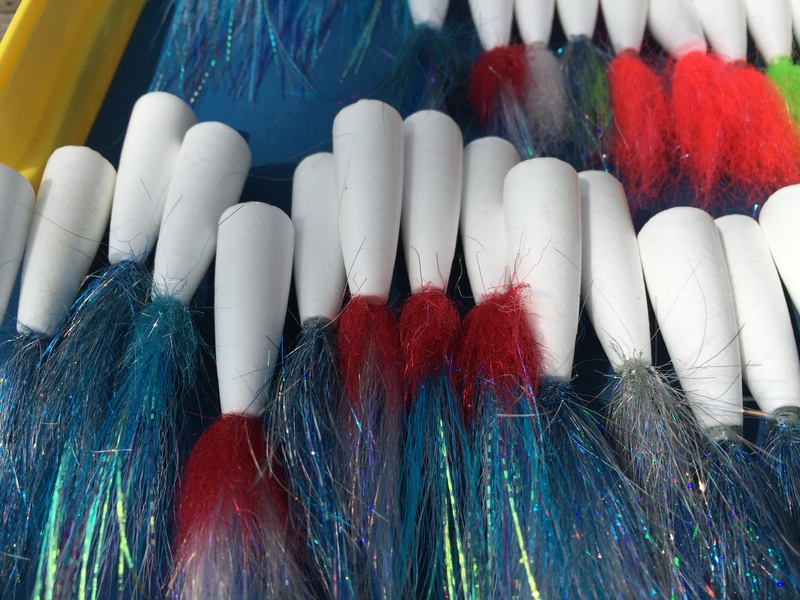 Steelhead Gurglers ready for the 2015 season. Hope you find a little inspiration here to tie your own poppers in whatever form – and do so soon. Jay Nicholas, April 18, 2015.